Joining us will be "Sheldrake Boothroy" - a great monoscene improv team. You've probably never seen improv in this format, so you can learn as you laugh. It's right after Labor Day, so this is your chance to show Summer that you will not go gently into that good Autumn. Thanks to everyone who came out to Sketch Block last night. Great show - thanks to Selena, Better Than The Machine, and The Chris And Paul Show. If you like Sketch Comedy (of course you do!) check out future shows at Sketch Block - they do it twice a month. See you on September 8th at The Broadway Comedy Club for our next show! 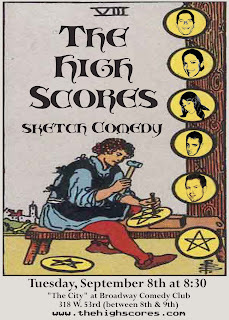 See The High Scores perform as part of "Sketch Block" on Thursday, August 27th at 8:30. It's at the National Comedy Theater at 347 W36th (btwn 8th & 9th). We'll be performing with a bunch of other sketch comedy groups, but we'll still be doing a bunch of sketches for you. Only $10, with no drink minimum. Thanks to everyone who made it out last night. Great crowd. Apologies for the slightly different arrangement, but thanks to Megan and all the stand-ups for joining in on all the fun. Special thanks to Smash-Face! Great improv and good times. 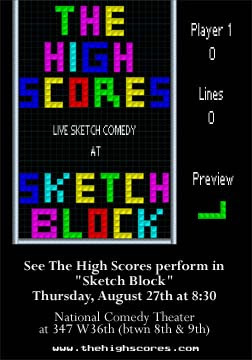 We'll be back at our regular gig next month at 'The City' at Broadway Comedy Club, but in the meantime see us perform at "Sketch Block" on Thursday, August 27th at 8:30. It's at a different place - National Comedy Theater at 347 W36th (btwn 8th & 9th). Of course, check back here for more details, or even better, join us on facebook for all the news worth hearing. Playing with us Tuesday is SMASH-FACE!!! That's great improv before we serve you our delicious sketch comedy. And it's only $5, cheaper than what you were going to do anyway, pervert.